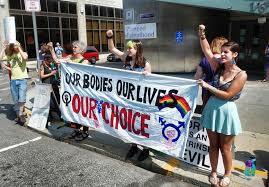 Pro-Female Genital Mutilation Protesters Clash with Pro-Abortion Protesters! Emboldened by a Federal judge in Michigan who ruled that outlawing female genital mutilation is unconstitutional, a group favoring the practice, aka “Snip it in the bud“, took to the streets demanding federal protection for their practice. In his remarks the mayor thanked the group for their kickbacks donations to his re-election committee and promised to do all in his power to protect them from the wrath of intolerant Republicans. “America was built on tolerance and inclusiveness” said the mayor. And there is no finer example of American values than female genital mutilation. Female genital mutilation is empowering to women. The practice of female genital mutilation frees women from being the sexual playthings of the male oppressor. I am married to an African-American woman and she agrees with me. I don’t know whether she’s been genitally mutilated or not but she never thrusts her hips when I enter her. Maybe it’s because she’s a lesbian. I don’t know. With the conclusion of the Mayor’s inspiring remarks the group continued its mostly peaceful march up Broadway. However at Union Square the group met up with counter protesters supporting abortion rights and the mostly peaceful marches quickly became still mostly peaceful with occasional mostly peaceful assaults. The pro-female genital mutilation group complained that the pro-abortion group would limit the number of available females to perform their ritual upon. “How can we snip it in the bud if there is no bud?” asked one of the pro-female genital mutilation marchers. The pro-abortion marchers countered by arguing that female genital mutilation was a barbaric practice and that only by making abortions widely available could women become empowered. “Not snip it in the bud, rip it from the bud” said one of the pro-abortion marchers. The two groups of marchers were about to break into a mostly peaceful riot when one of the marchers (from which group we don’t know) stood up and called for them to unite against the common enemy. Just then a white male of northern European origin was spotted and surrounded by the now-united protesters. He was mostly peacefully beaten unconscious for oppressing all female genders, binary and non-binary. The marchers then retired to their respective homes to watch Lifetime TV.